The governments of the State of Kuwait and the United States held the third US-Kuwait Strategic Dialogue, the first such dialogue hosted in Kuwait, on March 20, 2019. US Secretary of State Michael R Pompeo and Kuwaiti Deputy Prime Minister and Foreign Minister Sheikh Sabah Al-Khaled Al-Hamad Al-Sabah co-chaired the opening session. These dialogues produce concrete advances in our strategic partnership in defense, security, trade, investment, education, consular affairs, customs, border protection, and health issues. The dialogue builds on the September 2018 meeting between President Trump and His Highness Amir Sheikh Sabah Al-Ahmad Al-Jaber Al-Sabah at the White House and represents a year’s progress of the Strategic Dialogue’s working groups. Our two countries took the opportunity of this Dialogue meeting in Kuwait to renew their shared commitment to promote the stability and security of the region. Secretary Pompeo expressed the appreciation of the American people for the outpouring of affection and tributes from the leadership of Kuwaiti people on the passing of President George HW Bush. This dialogue process, begun in October 2016, has materially benefitted both nations; today, we are taking further steps to serve our peoples. Secretary Pompeo and Deputy Prime Minister al-Sabah signed a document formalizing the structure of the Strategic Dialogue and affirming both countries’ intent to continue broadening our relationships to meet mutual interests. On political cooperation, the United States and Kuwait discussed the most pressing regional political issues, including the ongoing GCC dispute. The United States reiterated its appreciation for the Amir’s extraordinary efforts to help reach a settlement, and the United States and Kuwait renewed their call for a resolution. Our two countries share a common view of the need for GCC unity in effectively confronting the region’s many challenges and in promoting a peaceful and prosperous future to the region. We discussed our productive coordination as members of the UN Security Council in 2018 and our priorities for the year ahead. We look forward to continuing our close collaboration in the Council in 2019 to address issues affecting international peace and security, such as countering terrorism and the use of weapons of mass destruction. The United States and Kuwait recognize the importance of the establishment of the Middle East Strategic Alliance among the United States, the GCC member states, Egypt, and Jordan. Both countries welcomed the discussions on January 9 in Muscat, Oman, on the economic and energy pillars, and the consultations on February 21 in Washington, DC, on the political and security pillars of the Alliance. We look forward to further coordination on the establishment of the Alliance, which will enhance multilateral cooperation between the United States and the participating States and address threats to our shared vital interests in regional stability, security and prosperity. The United States recognizes the continuous efforts taken by Kuwait towards maintaining security and stability in Iraq, as well as supporting the Government of Iraq in the process of reconstruction, by hosting the Kuwait International Conference for Reconstruction of Iraq on February 12-14, 2018, which resulted in $30 billion in pledges to Iraq. We welcomed the constructive dialogue that took place at the Ministerial to Promote a Future of Peace and Security in the Middle East in Warsaw, Poland on February 13-14. The United States appreciates Kuwait’s significant contributions to peace and security in some of the world’s most troubled regions and its willingness to serve as a key source of direct assistance to internally displaced persons, as well as to refugees hosted in other countries. The United States welcomes Kuwait’s recent announcements of additional humanitarian assistance for Yemen and Syria. The United States and Kuwait expressed their support for UN Special Envoy for Yemen Martin Griffiths and reiterated the need for all parties to implement the agreements reached in Stockholm during the December 2018 meeting and to continue working to advance the political process. Particularly as co-members of the UN Security Council at this time, our delegations reiterated the need for the full implementation of UN Security Council Resolution 2254 to help end the Syrian conflict and bring lasting stability to that country. We discussed and reviewed efforts to promote Middle East Peace and resolve the Israeli-Palestinian conflict. We also discussed other regional issues, such as Syria, Libya, and the destabilizing behavior of Iran. Both countries welcomed the February 6 ministerial meeting in Washington, DC, of the Global Coalition to Defeat ISIS/DAESH and re-affirmed the Coalition’s commitment to ensure the enduring defeat of ISIS. Both countries called upon the international community to fully implement UN Security Council resolutions regarding North Korea. On defense partnership, the United States reiterated its commitment to Kuwait’s security. Today, both countries continue to work together closely to ensure that the Armed Forces of Kuwait are effectively equipped to defend their nation through the acquisition of US systems such as the F/A-18 Super Hornet and the M1A2 tank, and by expanding US comprehensive professional training programs. We discussed our future defense cooperation and the priority of moving forward with modernizing the military facilities in Kuwait used jointly by our forces, as guided by our Joint Military Commission. We discussed future cooperation and the integration of our Armed Forces to enhance the defense of Kuwait in the most efficient and cost effective manner. The Joint Military Commission will continue considering opportunities for such integration, which both sides agree will enhance the defense of Kuwait. The Kuwait and US defense partnership plays an important role in regional security and stability, and it extends to areas of combating terrorism and deterring external aggression. 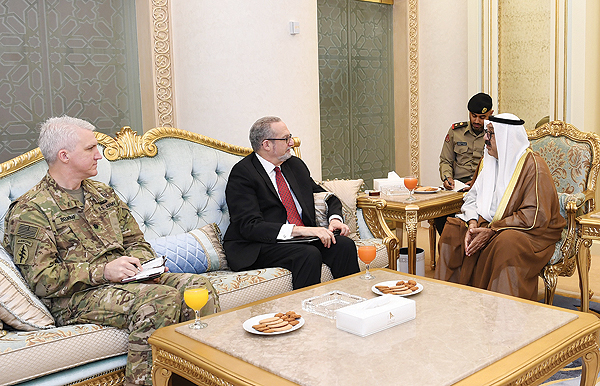 The US appreciates Kuwait’s efforts in hosting the Armed Forces Chiefs of Staff Meeting of GCC countries, Egypt, Jordan, and the commander of the US Central Command in September 2018. Kuwait and the US are looking forward to the multinational exercise “Eagle Resolve” to be held in Kuwait in 2020 with participation from GCC countries and the United States, to enhance the military capabilities and deterrence force. Today, we signed an agreement that will allow the US Department of Defense to provide defense articles, training, including counter-terrorism training, and materials to Kuwait on a grant basis. Both countries welcome the recent dedication of the site of the National Desert Storm and Desert Shield War Memorial in Washington, DC, and look forward to the future opening of this memorial. It will commemorate and honor those who participated in the liberation of Kuwait through their active duty service in support of Operation Desert Storm and Operation Desert Shield. With regard to security cooperation, the United States and Kuwait are strong partners in the fight against terrorism. Together, we are making the Kuwaiti and American people more secure. We agreed to expand this cooperation in order to thwart potential terrorist attacks. The United States reiterated its appreciation for Kuwait’s cooperation and its facilitation of the effort to ensure a lasting defeat of ISIS. Both countries remain committed to take further steps to confront global terrorist threats and cut off the financing of terrorism. Recognizing the benefits from combining our resources to defeat this scourge, our nations are taking specific steps to increase information sharing that will help deter terrorist attacks; our growing security cooperation seeks to deny refuge or sanctuary to terrorists and criminals. Training of Kuwaiti prosecutors and regular workshops provided by the United States will help the Kuwaiti government bring those engaged in the support or financing of terrorism to justice. This collaboration will continue. The United States welcomes Kuwait’s future engagements in the US government’s Anti-Terrorism Assistance Program, which have recently been agreed to by both countries. In implementation of this agreement, the United States will provide training to Kuwait’s law enforcement personnel to build their counterterrorism capabilities and skills. Today, the United States and Kuwait completed agreements to improve our cooperation to identify high-risk travelers that threaten both countries’ security. This will make all flights more secure. The United States and Kuwait discussed the dangers to society posed by narcotics trafficking. We signed today a memorandum of cooperation to enhance the counter-narcotics cooperation between the US Drug Enforcement Administration and the Kuwaiti Drug Control General Department. This will enhance our ability to disrupt transnational criminal organizations. The United States and Kuwait recognize the critical importance of cybersecurity and agreed on the need for close cooperation to prevent cyber threats. Cybersecurity cooperation between the United States- and Kuwait is growing across the public and private sectors. The governments of the United States and Kuwait signed a Letter of Intent on Cybersecurity Cooperation in September 2018. Today, we discussed further avenues for this cooperation. Both sides look forward to enhanced collaboration, including joint efforts to fight cybercrime and to further an open, interoperable, secure, and reliable, cyberspace. The United States welcomes Kuwait’s decision to join the 24-7 High Tech Crime Network, which facilitates point-to-point contact for investigations involving electronic evidence that require urgent assistance from member nation law enforcement partners. On Trade and Investment, increasing trade and investment ties between Kuwait and the United States have contributed to the growing prosperity of both countries. Two-way trade rose to more than $8 billion in 2017. Bilateral investment positions remain strong. Other cooperative actions underway focus on better managing risks associated with travel and the trade in goods, preserving the integrity of financial transactions and raising the level of cybersecurity. During the Strategic Dialogue, both countries pledged to seek ways to continue reducing barriers to trade and investment. Growing commercial relations between the United States and Kuwait complement our close official bilateral relations. During the second annual US-Kuwait Economic Forum on January 14, the US Chamber of Commerce and the Kuwait Chamber of Commerce and Industry signed a memorandum of cooperation to foster collaboration between the two. The US Chamber of Commerce is preparing to launch a first-ever US-Kuwait Business Council, to be composed of corporate members from both countries. On Tuesday, the US Chamber of Commerce in partnership with Kuwait Direct Investment Promotion Authority (KDIPA) held a roundtable with business leaders to discuss ways to increase trade and investment between the two countries. These developments follow important business-to-business exchanges during the year, including Kuwait’s strong participation at the Select USA Investment Summit in Washington, DC in June 2018, and Kuwait’s successful Investment Outreach Roadshow in Silicon Valley in November 2018. Kuwait has been an active long-term investor in the US, mainly through the Kuwait Investment Authority where the majority of its investments are allocated in the US or in US dollars. The United States recognizes the efforts of Kuwait Direct Investment Promotion Authority in facilitating investment procedures in Kuwait. Kuwait Vision 2035 provides potential fertile ground for direct investment in Kuwait. Today, our two sides signed a memorandum of understanding between the Kuwait National Fund for Small and Medium Enterprise Development and the US Department of Commerce’s International Trade Administration to promote innovation, entrepreneurship, and small business development. Formalizing this relationship supports Kuwait’s effort to further develop the private sector and to diversify its economy. The United States and Kuwait welcome the recent agreement between Boeing and the Kuwait Direct Investment Promotion Authority to deploy for the first time in Kuwait training solutions for the next generation of Kuwaiti pilots. On Educational and People-to-People ties, education remains a solid building block of the US-Kuwait partnership and a lasting bond between our peoples. Five generations of Kuwaitis have studied in the United States. Both countries continue to encourage more Kuwaitis to join the nearly 10,200 Kuwaitis studying for academic credit, and an additional 2,500 in intensive English language institutes in the United States. These numbers are expected to rise. We will continue to cooperate closely to prepare Kuwaiti students to succeed at quality US educational institutions, including through enhanced coordination in English language teaching and college admissions advising. In recognition of the unparalleled quality and diversity of US institutions of higher learning, our two sides will endeavor to expand the number of US institutions and fields of study available to Kuwaiti scholarship recipients, and the number of universities in Kuwait with US affiliations. We also will work together to facilitate an increase in the numbers of US students and scholars studying or conducting research at universities in Kuwait. In recognition of the importance of bilateral cooperation in the field of culture, the two governments signed a Statement of Intent to work together to enhance cultural understanding and people-to-people connections between the United States and Kuwait, in order to support the shared ideals of tolerance and appreciation for cultural diversity. As a result of this Statement of Intent, both parties will encourage partnerships between US and Kuwaiti cultural institutions, professional exchange programs, a diverse range of cultural programs, and programs that support and engage youth. During the 2017 Strategic Dialogue, the United States and Kuwait signed a memorandum of understanding for cooperation in the field of higher education. That agreement has already resulted in many productive academic and professional exchanges. In the next few months, a Fulbright Specialist in student advising for US college admissions will work with the Kuwaiti Ministry of Higher Education to ensure that Kuwaiti students have the most accurate and complete information about US institutions. The Kuwaiti Ministry of Education and the US Embassy will also be jointly funding an intensive English course for Kuwaiti public school teachers in spring 2020. Finally, the US Embassy will fund a new afterschool English course for underprivileged students in Kuwait, beginning in fall 2019. During the dialogue, we also discussed opportunities for increased collaboration, training, and exchange between our countries in the fields of education and academic research. 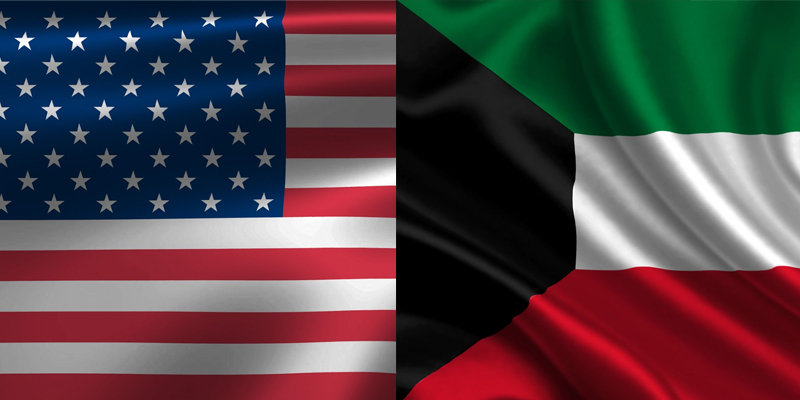 The United States and Kuwait welcome the reinvigoration of the American Kuwaiti Alliance, which works to expand people-to-people exchanges, increase business, investment and trade, and foster cross-cultural understanding. On consular Affairs, Customs, and Border Protection, we reaffirmed our commitment to the protection of our nationals in Kuwait and the United States and around the world, solidifying our international obligations to provide consular notification and access to detained citizens and expanding our efforts to assist our citizens during crises. The United States and Kuwait are working to improve our communication and partnership to prevent and resolve international parental child abductions according to the laws and regulations in both countries. Kuwait and the US affirmed their intention to establish a mechanism for prisoners’ transfer. Kuwait’s National Assembly recently ratified our Customs Mutual Assistance Agreement to improve information sharing, training, and enforcement of our customs and immigration laws. The entry into force of this agreement marks a significant milestone in collaboration on security and trade facilitation between the two countries. We welcome the cooperation agreement signed in September 2018 between our two governments that set up efforts to prevent the trafficking of nuclear and other radioactive materials, and we recognize the importance of mutual training and exercises. We also completed a comprehensive review of visa reciprocity to ensure fair treatment of our citizens in both countries. We also signed an agreement between KGAC and CBP that will enhance security and protect the international supply chains through data sharing that will identify high-risk cargo shipments. Kuwait and the United States welcomed the recent resumption of the Kuwait Airways direct flight to New York City, this was done in coordination between our two governments. This will have positive effects on all fields including business and tourism. The United States and Kuwait look forward to closer collaboration between the US Transportation Security Administration and the Federal Aviation Administration and the Directorate General of Civil Aviation. Kuwait reiterated its interest in becoming a pre-clearance border point to the United States. On Health Cooperation, the United States and Kuwait are strengthening their bilateral relationship in the area of healthcare and healthcare management. We have begun negotiations on a memorandum of understanding between the Kuwait Ministry of Health and the US Department of Health and Human Services that will identify areas of mutual collaboration. Looking Ahead, the United States and Kuwait commit to further increasing cooperation in all of the areas of greatest practical benefit to our governments and to our peoples, as we formalized today in the signing of the overarching Strategic Dialogue agreement. Today, we set a roadmap for the advancement of our relations in the coming year.